The customer is one of the most popular international package delivery service providers in the world. This US-based multinational company also provides supply chain management solutions. Outsource2india developed a dedicated web portal that allows chat agents to engage with customers and answer their questions. 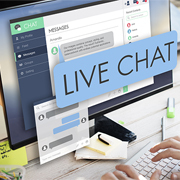 The live Chat Support service had agents who explained the process of purchasing with the payment on delivery option in detail. Our team succeeded in delivering this application within the time stipulated by the customer. With this service, the customer was able to increase customer engagement, retain existing customers, and even attract new ones. With more payment options available, our customer's buyers were more than just satisfied, resulting in increased revenues overall for the company. Outsource2india has been a leading provider of custom software development services in India and a plethora of other software development solutions. We have access to the best infrastructure and make use of the best tools and technologies to deliver the best quality services. Our team has the required skills and expertise to cater to any of the client's requirements. If you have a similar requirement, then feel free to get in touch with us.